The culmination of sophistication and raw appeal, our Bowen Nightstand showcases carefully preserved knots and grains that narrate stories of the reclaimed pine's past lives. 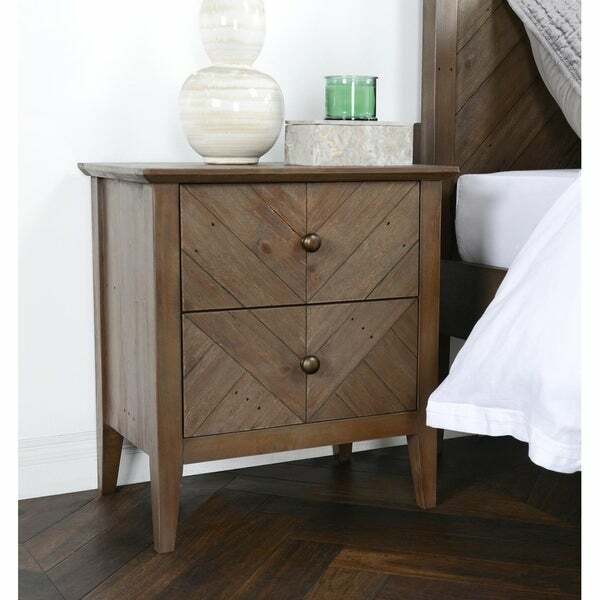 Tapered legs bring a touch of mid-century modern vibe and the chevron wood pattern displays meticulous detailing. Bring home the unique appeal of this organic style. Our reclaimed pine is hand-picked from various sources like shipping pallet and packing crates. This reclaimed pine wood is certified by the Forest Stewardship Council (FSC) and meets universal sustainability standards. The handcrafted nature of this reclaimed wood creates products with character and individuality. The inherent knots, grains, and variations in color and texture of the salvaged wood, are preserved, to create pieces rich in detail and natural beauty. These unique imperfections and variations are what define our products, with each piece having its own personality. Dust surfaces with a feather duster and wipe gently with a slightly damp cloth / chamois. Be sure to wipe any spills immediately; use coasters to protect surface from liquids. Do not place furniture in close proximity to heating outlets or direct sunlight. DO NOT USE: Silicone based polishes / cleaners; solvents; abrasives. Dimensions 16.0 In. X 24.0 In. X 26.0 In. Learn how to make the most of even the smallest bedroom space. Shop and save money on the best solutions for dealing with a small bedroom space at Overstock.com.